A 47-year veteran broadcaster, Arnie Stope spent his entire radio career at WFHR-AM, Wisconsin Rapids, beginning as unpaid trainee in May 1941. He served as a board engineer, operator, announcer, program director, community relations director, operations manager and assistant general manager. He was most widely known in his community for his 27-year stint as host of the daily call-in show, “Kaffee Klastsch” and was honored by numerous community groups during his career. 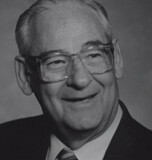 Throughout the Wisconsin state broadcast community Strope was known as the “best football producer ever” as he was dubbed by Wisconsin Badger football announcer Earl Gillespie who worked with him for over half of the 47 years Strope served as Producer/Engineer for the Wisconsin Network’s Badger Football broadcasts. Arnie Strope passed away on November 14, 2009. As my oldest & closest to my heart brother, Jon said, I remember all those things & lived all those times. My Dad was a perfectionist & loved what he did. So nice to listen to this video & hear his voice again. I miss him. I have tears. Thanks for the great memories of this memorable video. Arnie’s voice was oneI grew up with. My mom would have WFHR on in the house when I was just a kid. I’d listen to Coffee Klastsch with her and may have even called in a time or two. I always thought that was the neatest program, even today I tell people here in San Diego about it. And yes, Armie’s name is fondly mentioned miles and miles from Wisconsin. So glad to have heard him again on this video. For a moment, I felt 35 years younger.